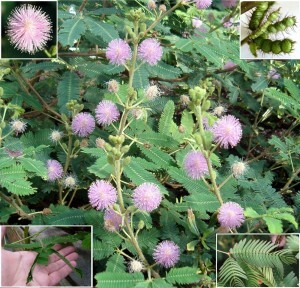 Distribution and habitat: Mimosa pudica is a creeping annual or perennial herb often grown for its curiosity value: the compound leaves fold inward and droop when touched or shaken, due to evolution from predators, re-opening minutes later. The species is native to South America and Central America. It has been introduced to many other regions and is regarded as an invasive species in Australia, South Asia and South East Asia and many Pacific Islands. It grows mostly in shady areas, under trees or shrubs. Description: Mimosa pudica is the only species of the genus Mimosa grown as an indoor plant. As an indoor plant is valued not only for its feathery leaves and fluffy, ball-shaped flowers, but also for the fascinating way in which the leaves behave when they are touched. The curios thing about Mimosa pudica is the way that if a leaf is handled, no matter how gently, it almost immediately folds in on itself and the leaf-stalk reacts by drooping downward, taking the folded blade with it. This sometimes sets off a chain reaction, with several of the leaves falling onto one another, causing the apparent collapse of a whole small section. This collapse is merely temporary, though. After a short time – normally, about half an hour – the plant will be fully recovered. Some authorities suggest that it may be unwise to touch-test Mimosa pudica too often, however. It is evident that some specimens have been thought to react less quickly and to recover less efficiently when they have been purposely ‘played with’ a bit too frequently. This shrub-like plant grows to 60cm (24 inch) tall and its much branching stem carry light green leaves with leaf-stalk up to 10cm (4 inch) long. The stem are spiny and are sparsely coated with fine, white hairs. The leaves are bipinnate – they are divided into a several sections (pinnae), each of which is further subdivided into many little leaflets (pinnules). The narrow, 2-5cm (0.8-2 inch) long pinnae are composed of tiny, elliptic pinnules arranged in rows of oposite pairs. From about mid-spring to early autumn, clusters of five to eight mauve-pink flowers appear on short stalks from the leaf axils. Each flower consist of hundreds of fine filaments and look like a fluffy pompon up to 1.5cm (0.5 inch) across. The leaf axils, too , are usually tufted with bristly, white hairs. Mimosa pudica is a perennial and may be kept alive indefinitely under the right conditions. Because it tends to become unsightly as it ages, however, most indoor growers prefer to discard each specimen when it has finished flowering at the end of a single season. Plants are generally acquired in early spring and retained until about mid-autumn. Houseplant care: When plants get too tall, prune them back to manageable size. It is best to do this only when they are actively growing. Light: Grow Mimosa pudica in bright light. In order to bloom successfully throughout the summer months, it must have at least three or four hours a day of direct sunlight. Temperature: Normally warm room temperatures are suitable for Mimosa pudica throughout the year. Because Mimosa pudica needs high humidity, however, it is good to stand pots on trays of moist pebbles. Preferably 50% or higher; however, they will tolerate low levels with no harm. Water: Water moderately, giving enough at each watering to make the potting mixture moist but allowing the top couple of centimetres (0.8 inch) of the potting mix to dry out before watering again. Fertilising: Apply a high-potash liquid fertiliser once every two weeks. Potting and repotting: Although best treated as a temporary plant to be retained for one season only, Mimosa pudica requires repotting several times during that period. Use a soil-based potting mixture and move each plant to a slightly larger pot whenever the roots have totally filed the current pot. Root ends appearing through the drainage hole at the bottom of the pot will indicate that repotting is necessary. The plants flowers best and its foliage is at its most characteristic, however, when the roots are confined in a relatively small space. A 13cm (5 inch) pot should be the largest required pot size. The leaves of a newly reppoted Mimosa pudica may seem to be alarmingly droopy, but they should recover swiftly. Propagation: Propagation is from seed sown in early spring in 8cm (3 inch) pots of rooting mixture (equal parts of peat moss and perlite, vermiculite or coarse sand). Plant three or four seeds in one pot, place the pots in bright filtered light and give only enough water to make the potting mix barely moist. After the seeds have germinated (probably in no more than two or three weeks), discard those seedlings that look least strong and healthy. When the remaining seedling have singly in 8cm (3 inch) pots of standard soil based potting mixture and from that time onwards, treat the young specimens as mature Mimosa pudica. Problems: Mimosa pudica plants have susceptibility to spider mites and should be watched carefully during times of high temperatures and low humidity or if these insects are present in adjacent plants. Discolouration of leaves and webbing on plants are signs of spider mite infestation. Treatment: First thoroughly spray the plant, both top and underside of leaves with water, then administer either insecticide or insecticide soap according to the label instructions. They also are highly susceptible to root disease, especially during the winter months. Treatment: Maintain temperatures above 18°C (65°F), grow in full sun, water only the soil is virtually dry to prevent rot root. 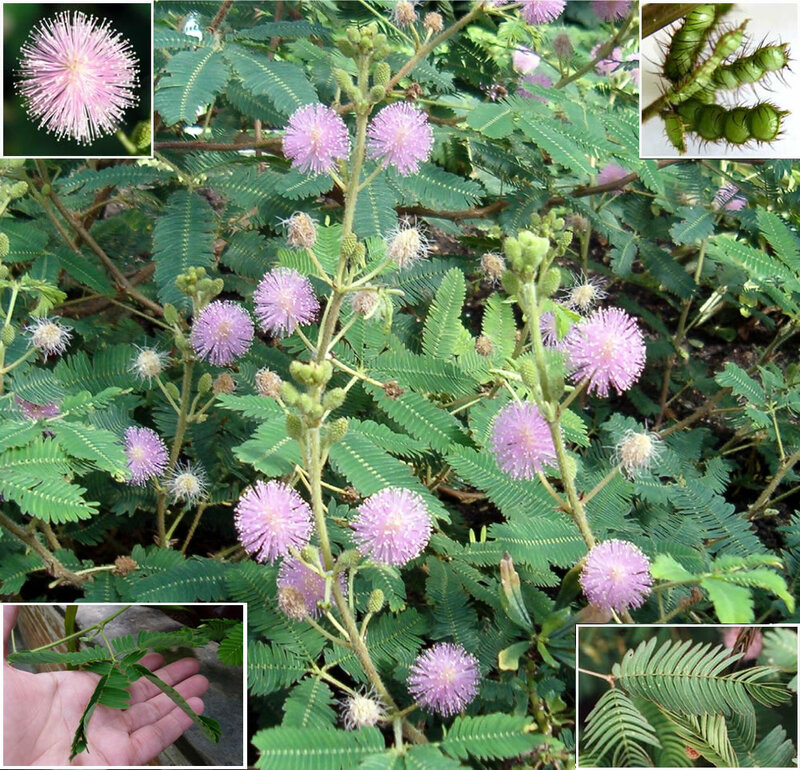 Note: Mimosa pudica can be a troublesome weed in tropical crops, particularly when fields are hand cultivated. Crops it tends to affect are corn, coconuts, tomatoes, cotton, coffee, bananas, soybeans, papaya, and sugar cane. Dry thickets may become a fire hazard. It is regarded as invasive in Asia and Australia and is a declared weed in some territories. Uses and display: In cultivation, Mimosa pudica is most often grown as an indoor annual, but is also grown for groundcover. Its unique ability to fold its leaves when touched or disturbed makes this plant interesting especially towards children. Apart from its fascinating behavior of folding its leaves, this species also displays beautiful pink powderpuff-like flowers throughout the year.